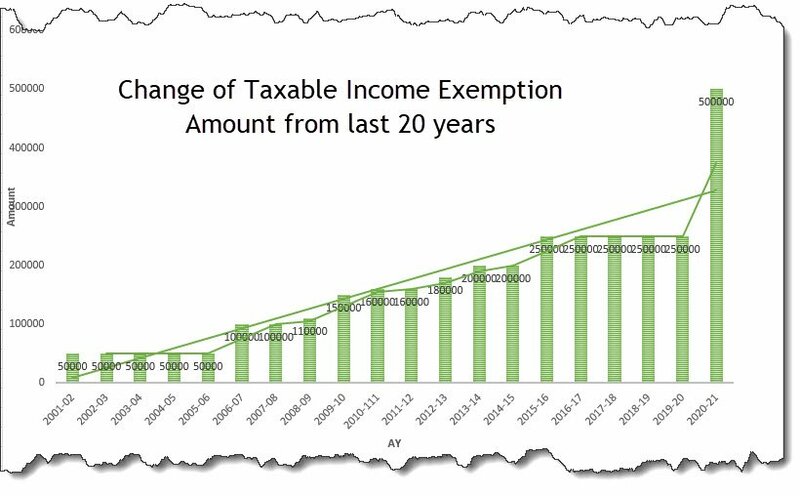 Home » Income Tax Slab of Last 20 Years From AY ‘2001–2002’ to AY ‘2020–2021’. Understanding Income Tax Slab before calculation and assessment of tax is very important for tax expert as well as a common man. Also, Read Mistake rectification under section 154 of income tax act. Also Read: Awesome! (5) Easy Ways to “E-verify” Your Income Tax Return. From AY 2006-07, tax slab is bifurcated according to men, women & senior citizen. Tax slab for Men up to 65 years of age. Tax slab for Women up to 65 years of age. Tax slab for Senior Citizen aged above 65 years. Tax slab for Men up to 60 years of age. Tax slab for Women up to 60 years of age. Tax slab for Senior Citizen aged above 60 years. In addition to the above details, the taxpayer also gets the rebate under section 87A, which is also changed frequently. According to the above information, you can see the change in taxable income, which is changed by ₹ 50,000 to ₹ 5,00,000 (1000 % change). This percentage clearly shows the change of Income an individual holds in their pocket.